Softphone Headsets Cultivate Quality Communication - Headsets Direct, Inc. The softphone technology advancements have given business owners and sales representatives a practical solution to multitasking with further opportunity to increase focus and task completion. By using a VoIP (Voice Over Internet Protocol) phone system, you can affordably set up your old desktop’s phone to connect to its service provider via your Internet connection, rather than the typical hard line way. A softphone headset permits the internal desire and drive of all businessmen to accomplish more during the day. Whether traveling to and from meetings or on the road again for a convention, using a headset for your softphone setup completes the circle of perfect communication. The headsets available through Headsets Direct that are compatible with a softphone solution are nothing less than the high quality you expect of all your office equipment. 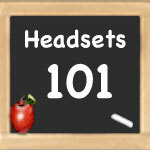 There are different styles you will have to decide between, but if you’re unsure which models will best work with the current system you have, you can always consult the Headsets 101 Buying Guide here. There are days that you either need another assistant or more hands because there is simply too much to do in a day! That stress headache you get at the end of the day because you felt like you could’ve done better can disappear for good once you start using a headset with a softphone setup. Any calls coming in to your business phone number can be redirected to your headset. Do you travel a lot and meet with clients on a regular basis? Great communication is one of the most valued pillars of success because it can be very difficult to cultivate. If you can establish a strong reputation for being easily reachable, your clients will spread that beautiful trait to their friends or “potential clients”. Plantronics offers 2 very different grades of computer/PC headsets. The .Audio series for home use and the Blackwire series for business professionals. 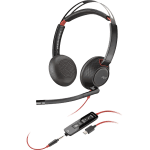 While HeadsetsDirect.com offers multitudes of models, you will find that the USB softphone headsets offer the maximum mobility and freedom compared to the wired and corded models. A USB softphone headset will connect to your laptop or desktop computer that is running the VoIP software and will be able to accept incoming calls to the office phone and computer based communications. Many salesmen find they talk with their hands when really trying to convey a point of sale. Allow your salesmen the freedom to feel comfortable and natural in a conversation by freeing up their hands. As a salesman feels the ability to speak naturally, his or her sales will absolutely increase because he or she is truly communicating with people, not simply speaking over the phone. Watch business and sales grow and maybe even get rid of those end-of-the-day stress headaches with the freedom a USB softphone headset will give you.